Today we are looking at a grand old school building at Annerley - Junction Park State School, pictured here in 2015. As mentioned previously in these pages, this was my first primary school. I was a pupil there for about five years in the mid-1950s. Yes, the middle of last century! I can't quite believe it myself! My memories of the school are fairly minimal now, but the main recollection is that it was very imposing. I suppose that is only natural to a five year-old leaving the security of home for a six or seven hour day in an environment of strangers. At the time I was there, there was an infants' school that catered for years 1 and 2, and the rest of the grades through to year 8 were housed in the main school. The infants' school had its own head, and in my years there that was a Miss Flannery. Memories of those first years include writing on slates with slate pencils that were sharpened by rubbing them on concrete; "tidy boxes" which held the items cleared from each student's desk at the end of the school day; reciting the alphabet (A like an apple on a twig, A says "a"); parades where we were lined up in order of descending height. Graduating from the infants' school to the "big school" was a rite of passage that was greatly anticipated. The head of that school in my time there was Mr Irish, a huge man with a loud voice and a reputation for fearsome corporal punishment. I'll never forget the day that he addressed the morning parade and ordered anyone wearing denim pants to go straight to his office after parade. It appeared that I was the only one! "You're gonna get the cuts!" whispered the kid next to me, helpfully. I was nearly throwing-up by the time that I arrived at Mr Irish's office. But the reality didn't match the reputation. He was kind and considerate, but told me that I mustn't wear jeans to school. When I reported this at home my mother said "We'll see about that!" Next day she was up at the school telling Mr Irish that I would be wearing jeans to school, as the alternative would be for me to continue my education in my underwear. That was the end of the matter! But that's enough of my history - let's look at the school's history. The school originated as a provisional school with a dozen or so students in 1888 in a different site near Stones Corner. As the attendance increased it was necessary to have permanent facility. With the help of William Stephens MLA some land near Ipswich Rd was obtained in 1890 and a school building and a teacher's residence were erected shortly after. The school opened on 31 March 1891 in the expectation of attracting up to 280 pupils - 425 turned up! In 1892 the name of the school was changed from Thompson Estate State School to Junction Park State School. 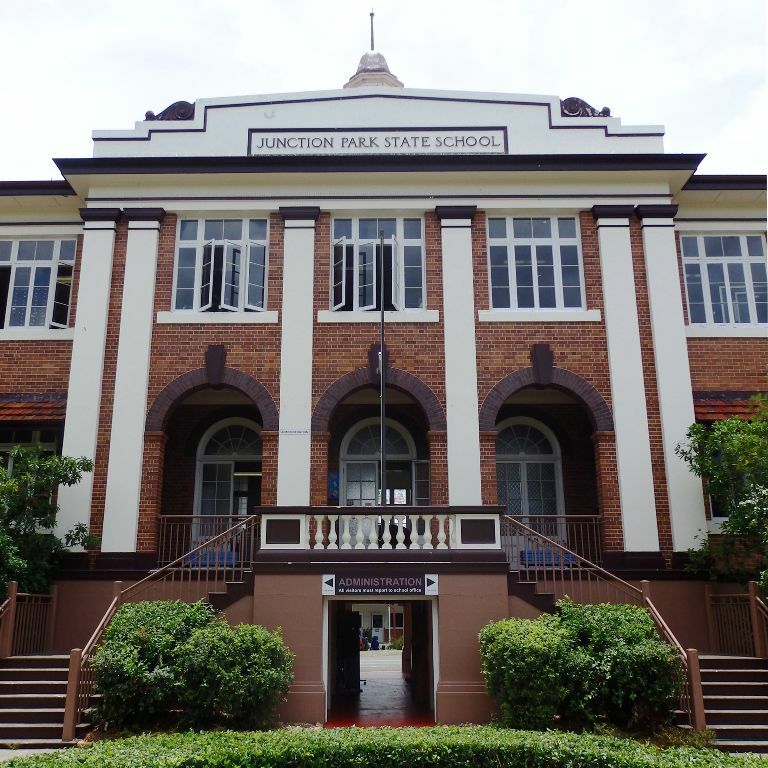 As befits one of Brisbane's oldest schools, there were some significant changes over the ensuing years. In 1910 it became the first state school to have its own swimming pool and in fact it opened a second larger pool in 1929, which meant that the earlier pool could be used to teach infants to swim. I had my first swimming lessons in that pool, not without some difficulties at times. In 1936 a new brick school building was completed for a reported £28,000, designed by the State Public Works office and constructed under the Forgan Smith government's program to provide jobs during the depression. The classic design and masonry construction have ensured that the school has stood the test of time. Here's a photo from 1936, around the time of the opening of the school's new building. During the post-war baby boom enrolments of around 1500 positioned Junction Park as the largest school in Brisbane, requiring the construction of new buildings and amenities. Further extensive details of the school can be found on this page of the State Government's Heritage Register, and also on the school's own web pages. It appears that being heritage-listed doesn't come without disadvantages however. Recent reports indicate that repairs to another school of this era have risen from stratospheric to other-worldly as a result of the heritage factor. And in the midst of the current hot spell in Queensland, it was also claimed by the news bulletin that school pupils were treated badly by comparison to prisoners, because jails have air-conditioning while many schools do not.